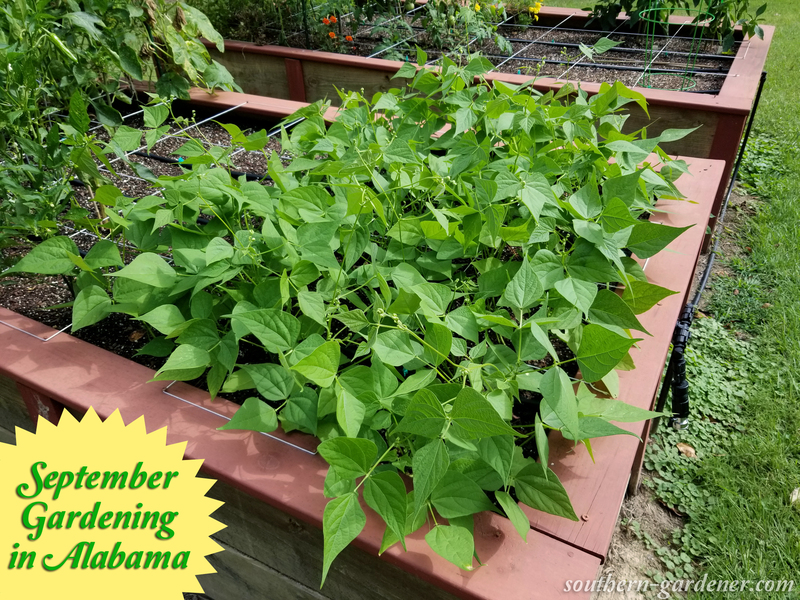 Around the beginning of September, I am ready for fall and cooler weather here in Alabama! Let’s face it. Doing yard work and gardening stuff when it feels like 102º isn’t fun. It’s a chore, and about the only thing I do outside right now is make sure my plants stay hydrated. 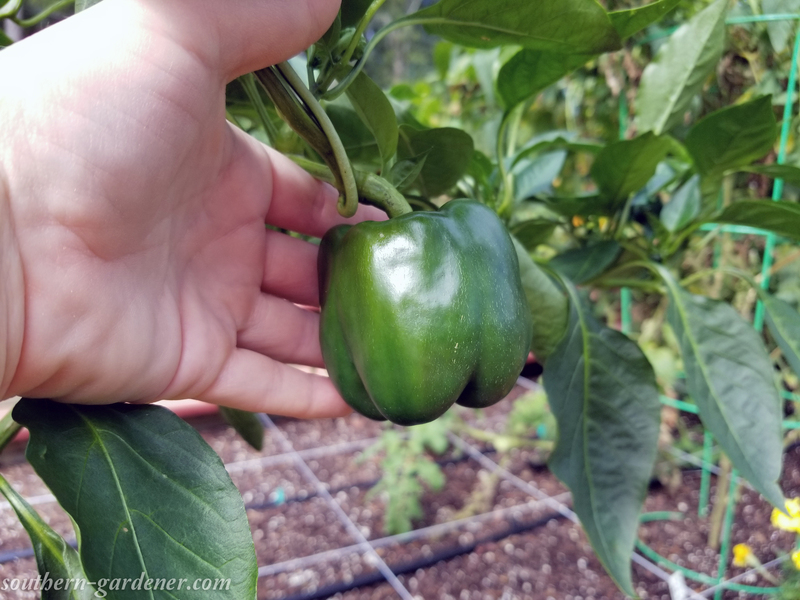 I took some pictures of the vegetable garden yesterday while I was out watering stuff and wanted to share with you what’s still growing in my garden, what’s doing well, and what issues I’m having. 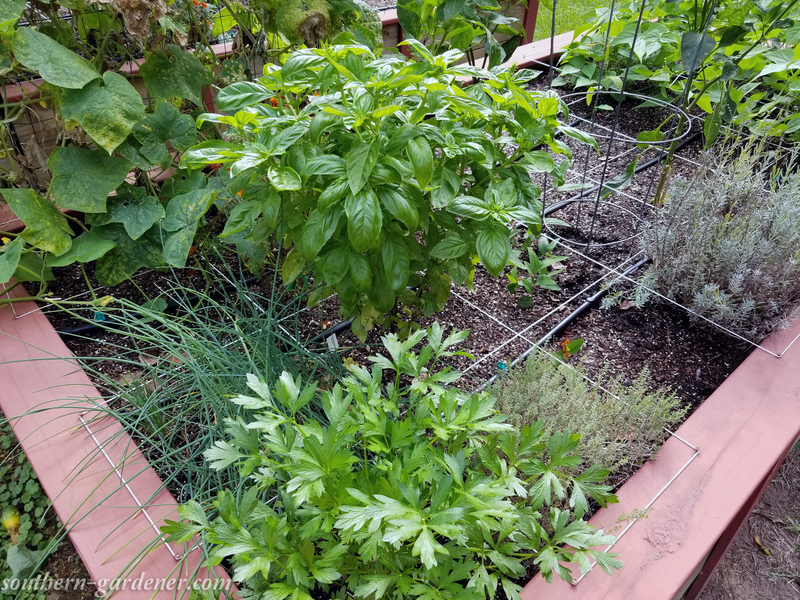 I also did a quick video walk-through of the garden that you can watch if you’d like. 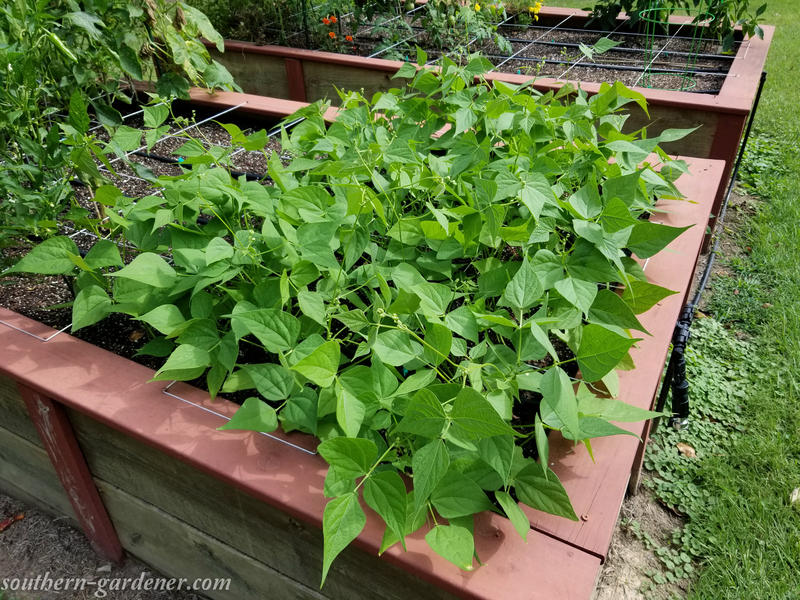 My bush Italian-style green beans are doing amazing right now! 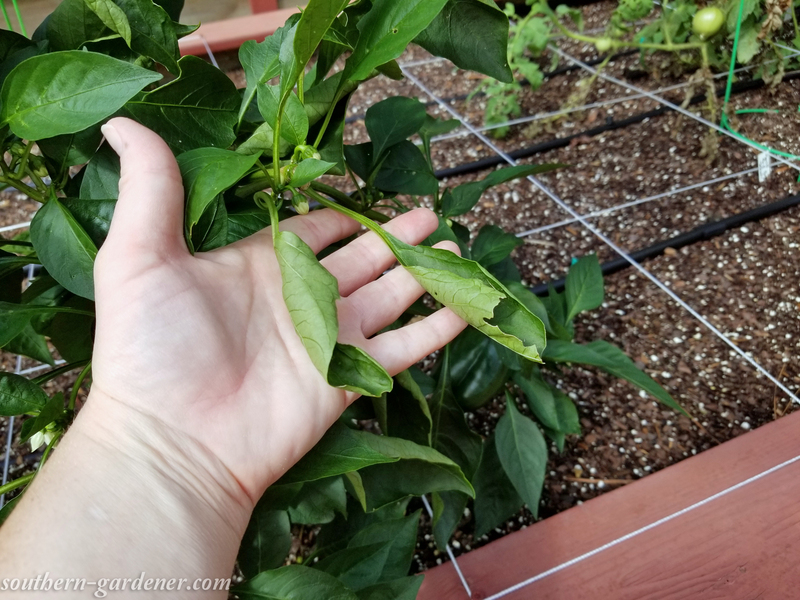 This is the 2nd crop of green beans for the summer, and the first time I’ve done a second crop. 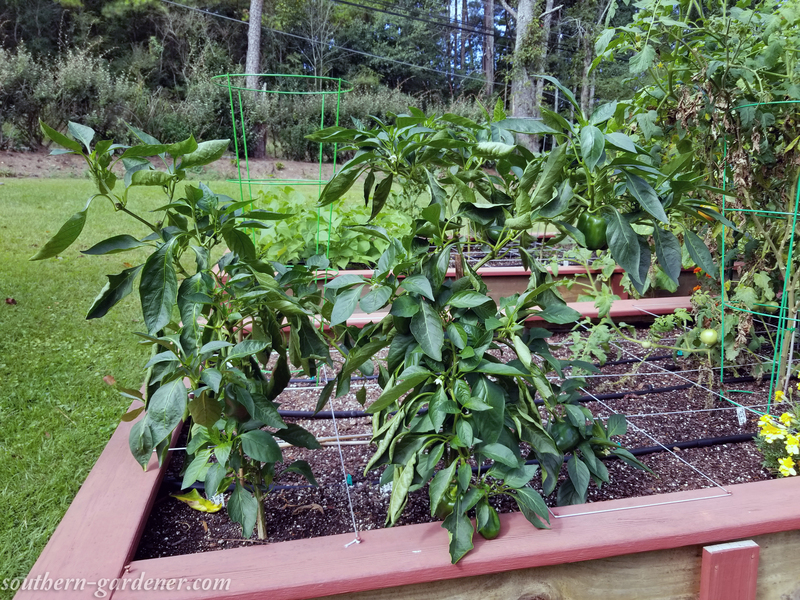 They’ve got flower buds on them, so we’ll have more green beans soon. I didn’t thin these seeds to one plant per square though. 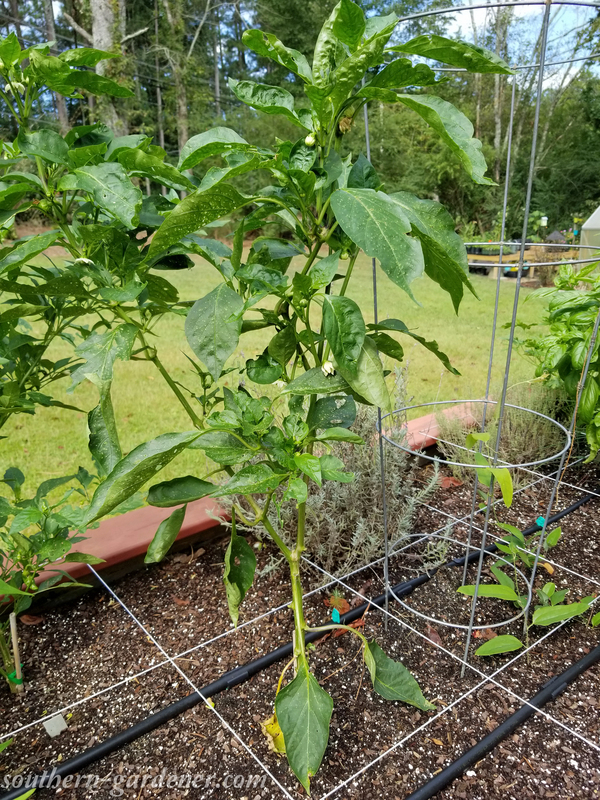 There are 2-3 plants per square this time, so hopefully that doesn’t become difficult. 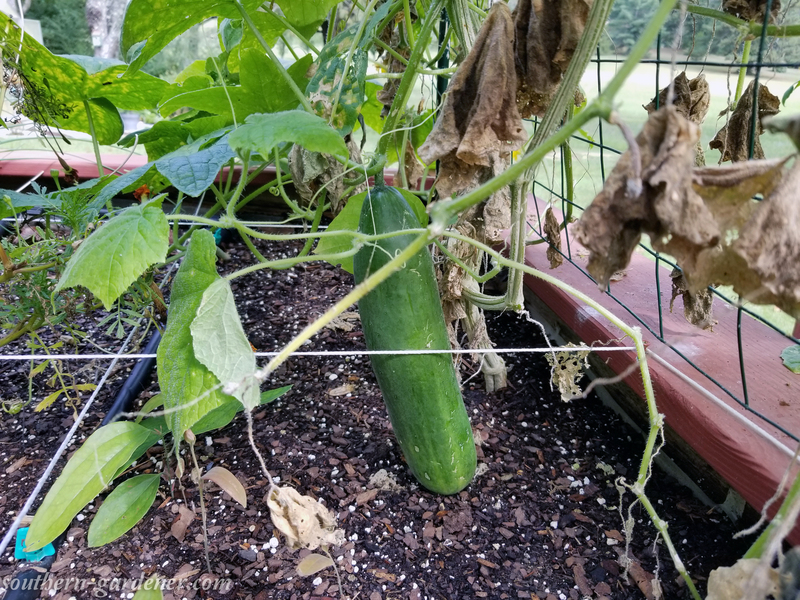 Next are my cucumbers… they were so slow to start producing this year, but when they took off, they really took off. Now the vines are out of control and are trying to take over the garden. 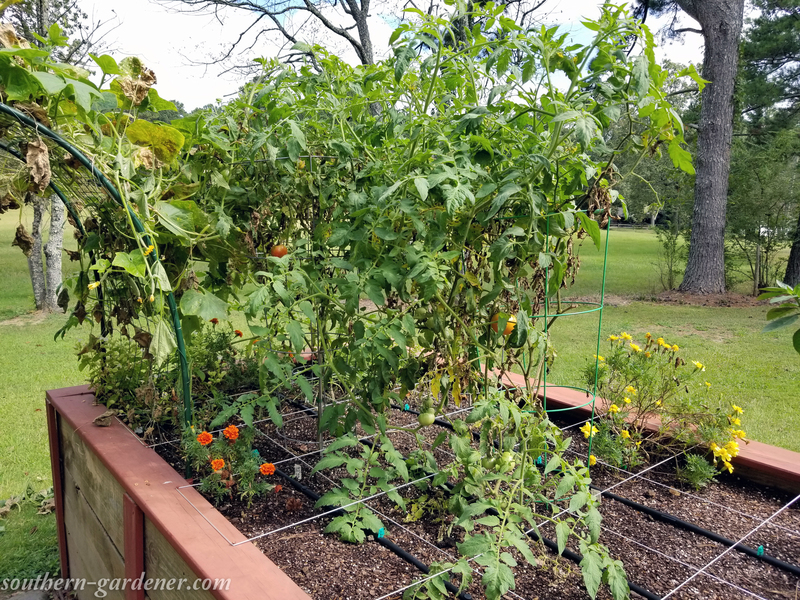 Excuse the mess on the ground as I had just gave them a big trimming back before these pictures and failed to noticed the ugly pile of cuttings on the ground. 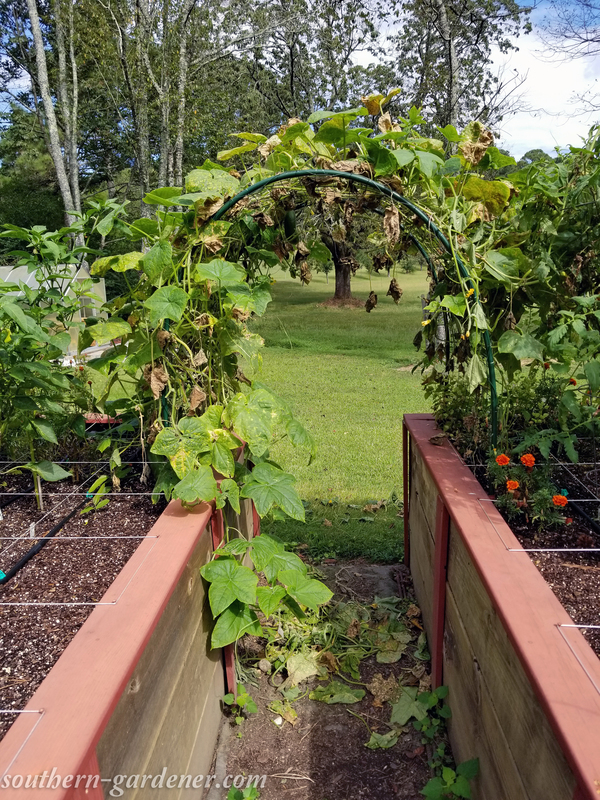 Next year I will not plant so many seeds to grow on the arch. 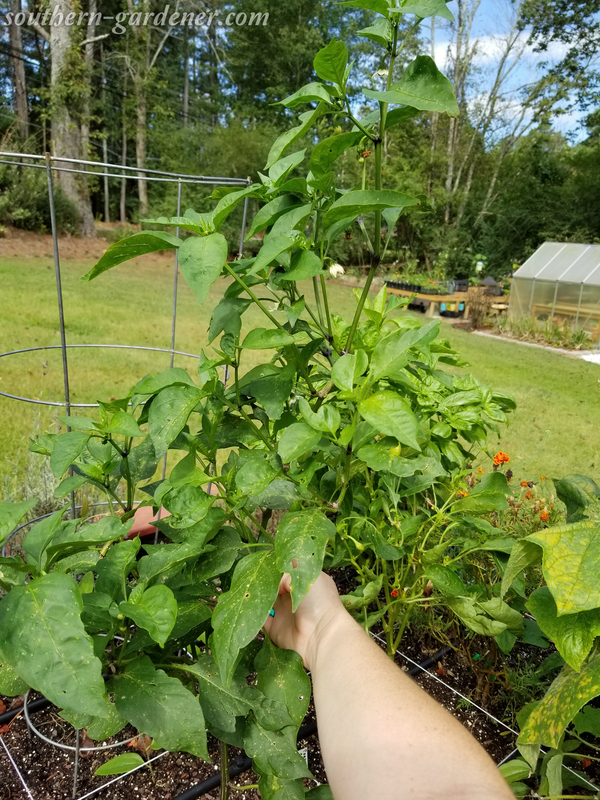 There were 4 plants, but 2 of the plants probably had 2-3 seeds in them. Oops! Oh, and if you see these little bugs below in your garden, DON’T KILL THEM! 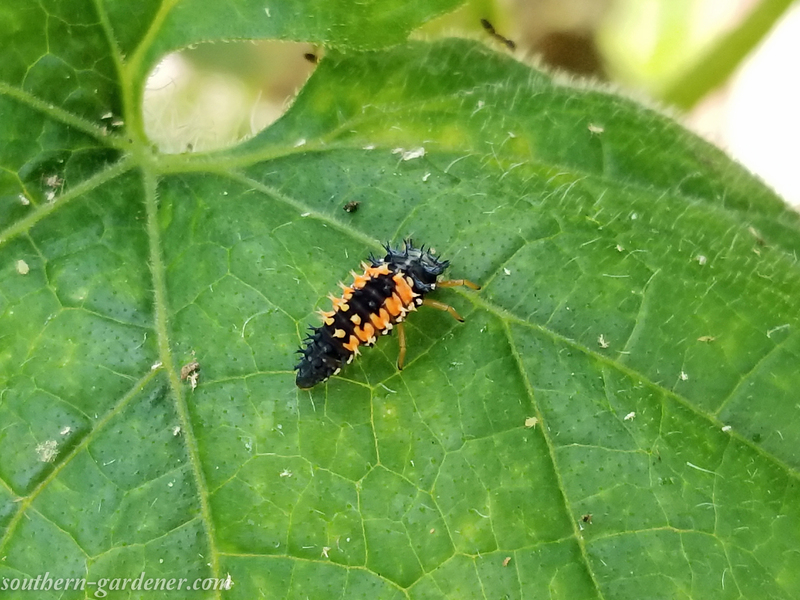 They’re ladybug larvae. I sprayed them before taking the time to Google and find out what they were, but fortunately this bug spray doesn’t seem to work, so they’re still alive. 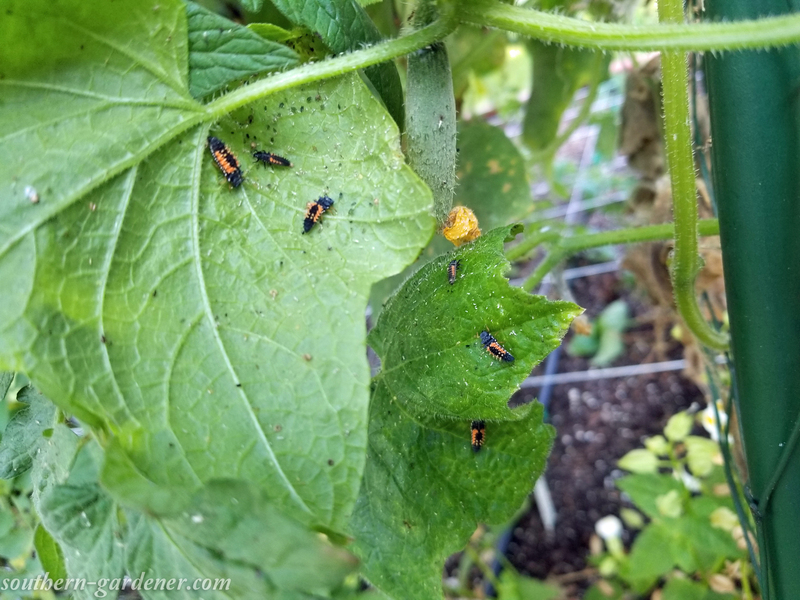 They are taking care of the aphids that have started infesting my cucumber leaves. 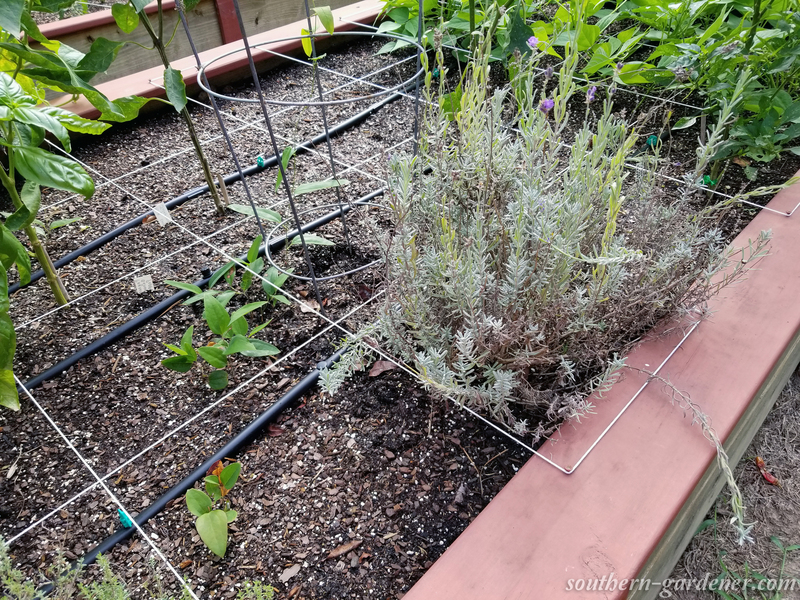 The herbs are doing fairly well in the garden, although the lavender is looking pretty rough right now. It’s done great pretty much all summer. I’ll have to check on it in a day or two. 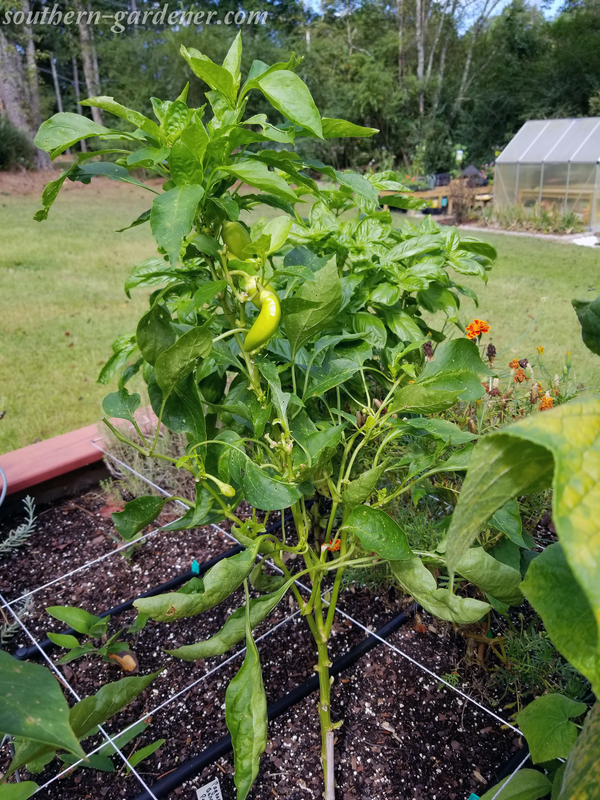 I am growing 5 different pepper varieties, and some are doing better than others. 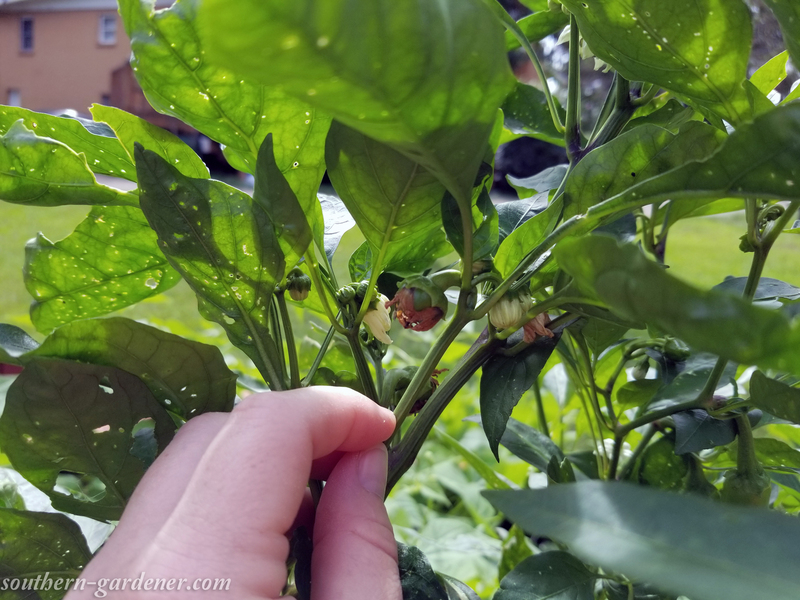 My Cutlas bell peppers are producing lots of small peppers, despite droopy leaves. I think this is insect related and not from heat or a lack of water. 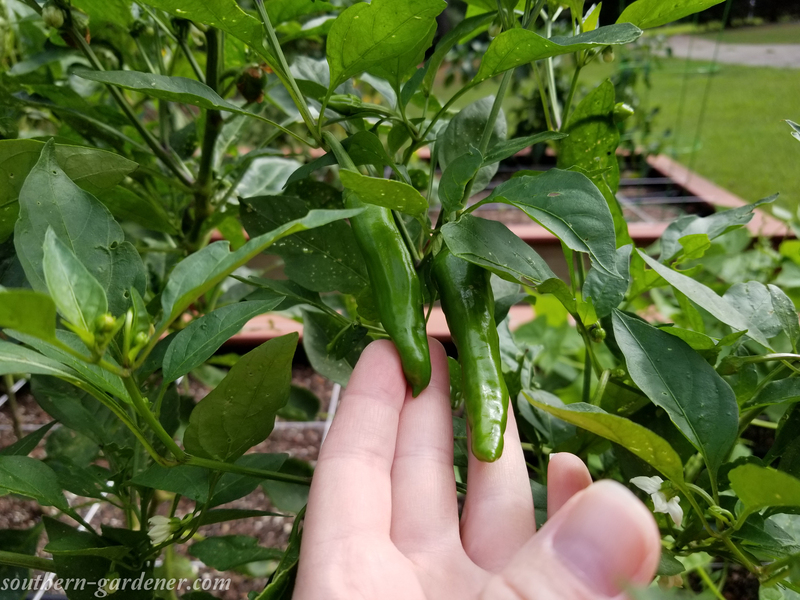 My banana peppers and jalapenos are slow to produce this year, but they were heavily shaded by the tomatillo plants (which are now gone) for a long time. 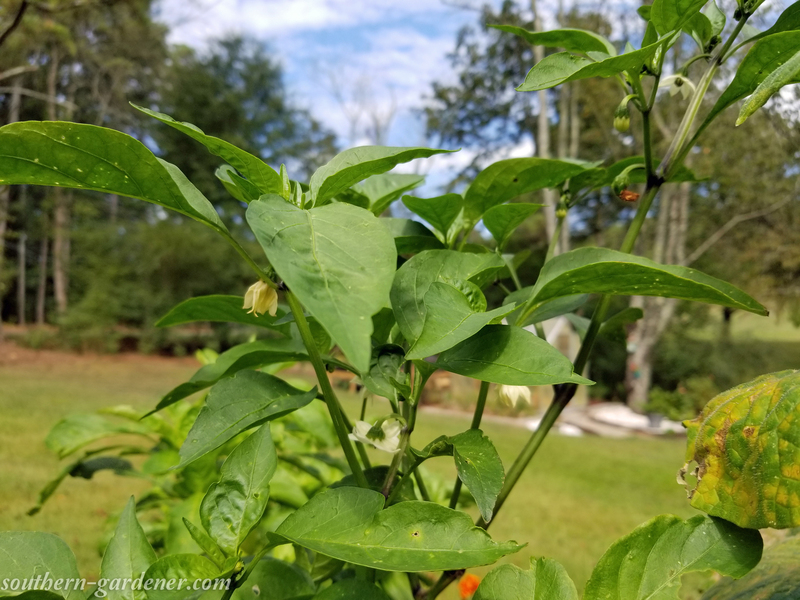 My Red Knight bell pepper is thinking about growing some peppers, and my pepperoncini pepper plant is producing at the moment. 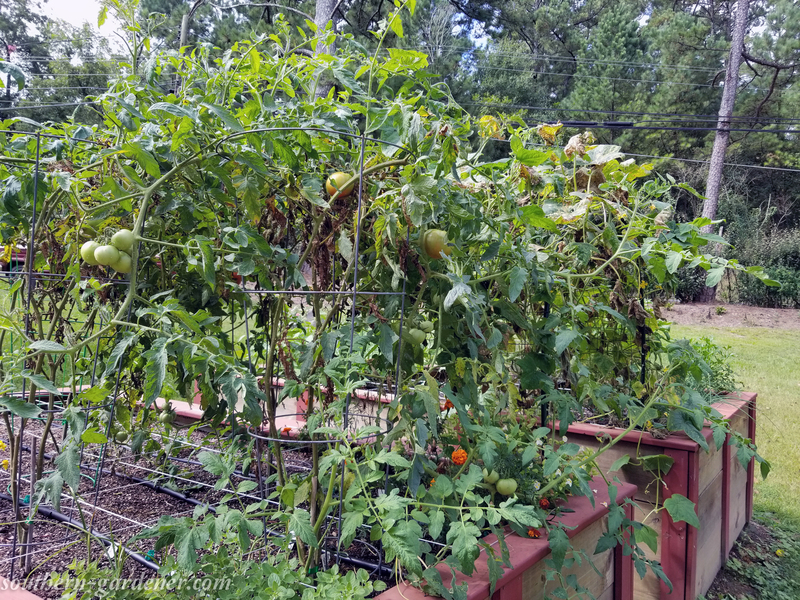 I currently have 2 varieties of tomatoes left in the garden, and they are doing really well for it to be so late into summer. 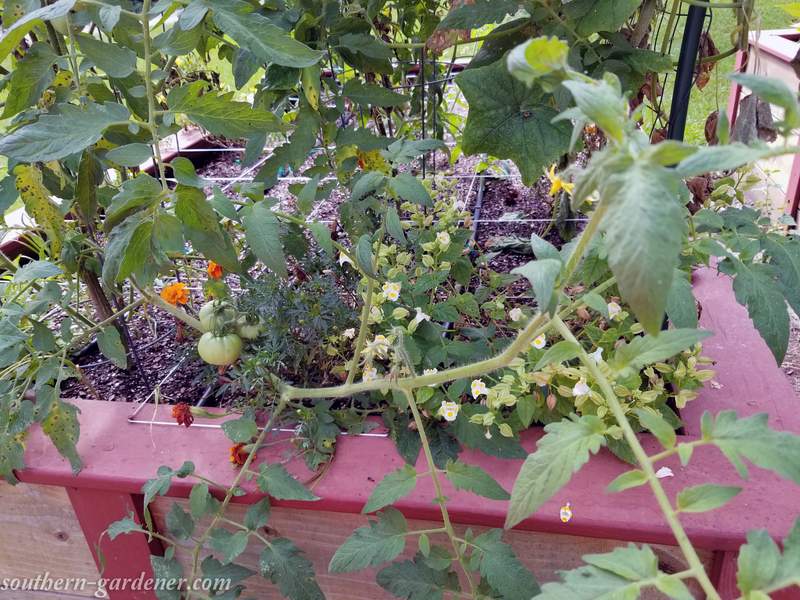 Some parts of the plants look a little rough, but the tomatoes forming on the plants make me excited! 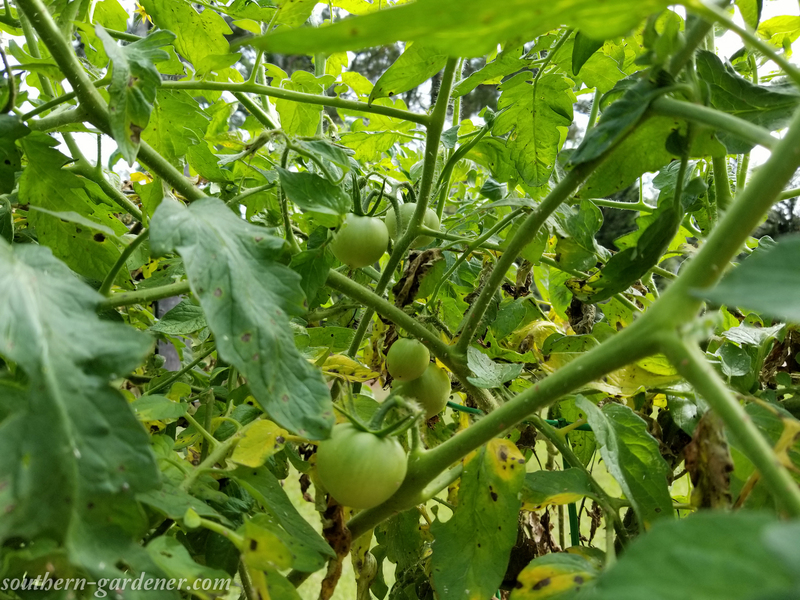 This is the first year I’ve had decent luck with tomatoes in my raised beds, partly because (I think) fungus in the soil. 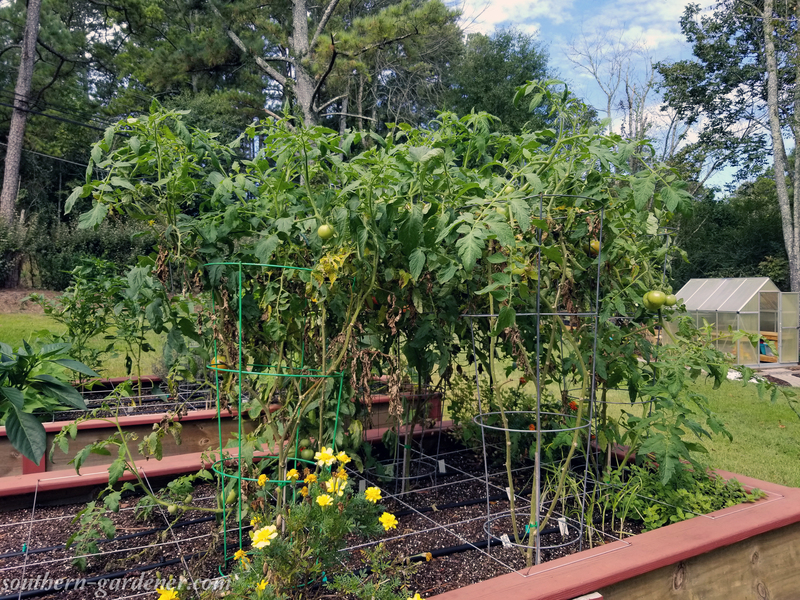 Bush big boy and Park’s whopper tomato currently occupy (and are taking over parts of) my vegetable garden. And that’s the current status of the vegetable garden! 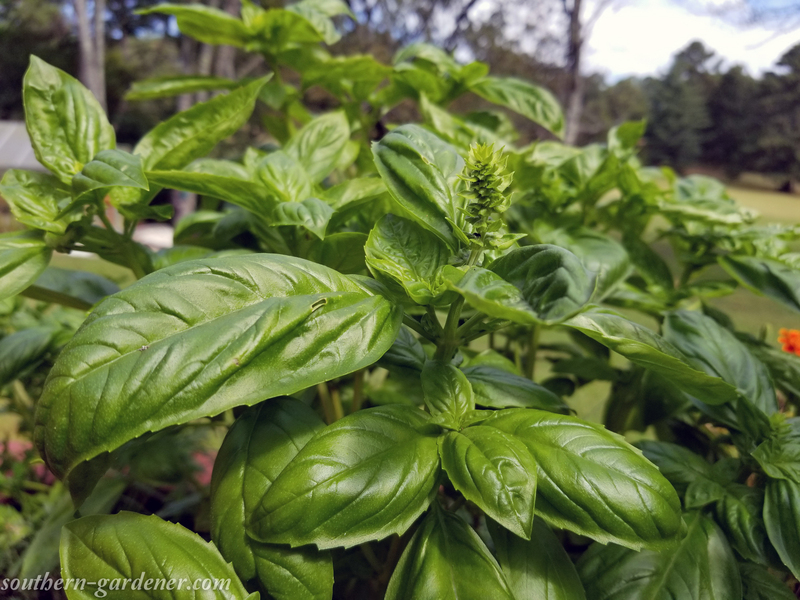 What are you still growing in your garden? 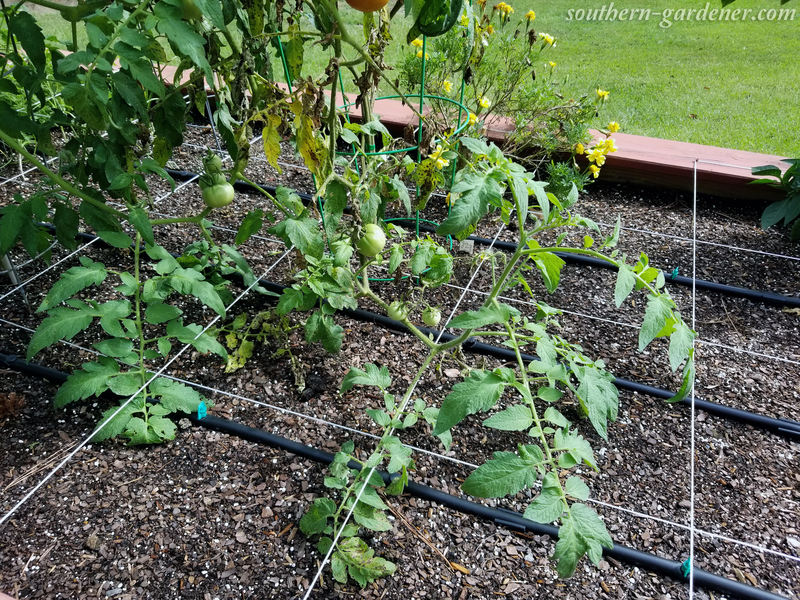 Posted in Raised Garden Beds and tagged vegetable garden.